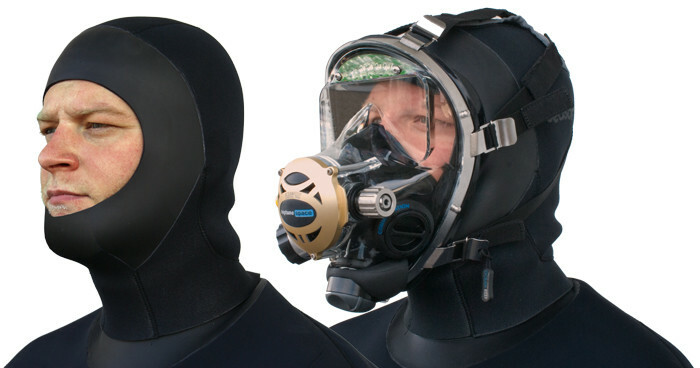 The SEASOFT PRO / M6™ 6 mm Drysuit Hood is designed to be worn with a full face mask. It has a skin-in seal facing the diver's face AND a skin seal facing out toward the mask with a layer of tough nylon fabric sandwiched in between the two. The three back panels are compressed neoprene for thermal protection so that your hood is NOT getting thinner as you are getting deeper. SEASOFT uses 4 different types of neoprene to make these hoods. The SEASOFT PRO / M6™ 6 mm Drysuit Hood is the best commercial diving hood available anywhere. Now available in 2XL to Xtra Small! Why should you buy this SEASOFT PRO / M6™ 6 mm Drysuit Hood? The SEASOFT PRO / M6™ 6 mm Drysuit Hood is our commercial drysuit hood designed to be worn with a full face mask. The PRO / M6™ has a layer of skin on the inside and on the outside with a layer of tough nylon in between these two layers. The skin allows the hood to seal to your face and the full face mask to seal to the hood. Of course, the three back panels are of compressed neoprene to provide you with thermal protection as you descend. You don't want your hood getting thinner as the water is getting colder. There are no seams down the middle of the chin, this prevents jaw fatique. There are two layers of Titanium Flake Foil™ for added heat retention. At the top of the hood there are two small holes with a built in baffle system inside the hood to purge excess air from inside your hood while preventing any cold water from entering. The SEASOFT PRO / M6™ 6 mm Drysuit Hood is the perfect commercial hood for that specific dive.